This paper focuses on the increasing role played by lower- and medium-income countries in the global economy. In particular we look at the role of outsourcing in the process of trade integration of these countries. Further we discuss the impact of these integration patterns upon labour markets with a focus on the position of different skill groups of workers. The paper provides descriptive evidence on the changes in trade patterns over the past decades, distinguishing between product types (primary, processed, parts and final goods) and the sectoral structure (i.e. industry groups according to skill intensity). The paper reveals that there is an upward pressure in the skill content of exports to the EU in particular from low- and medium-income economies. The observed changes in skill content and in the shares of imports by these economies particularly for processed inputs and parts production are interpreted in a catching-up framework combined with outsourcing: High-income countries lose market shares mainly in processed inputs and parts but less so in final goods. With respect to country groups, especially the new EU member states account for a higher share of imports in EU Northern economies together with the fact that these countries shifted their export structure towards parts. EU Southern countries are more strongly present in processed inputs whereas the Rest of the World countries tend to shift exports towards final goods imports. 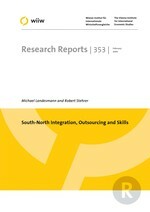 This confirms the hypothesis that geographic proximity is important for outsourcing activities.